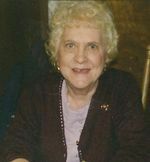 Betty (Harvey) Hall age 77 of Sandusky, passed away Saturday November 21, 2009 at the Stein Hospice Unit following a brief illness. She was born February 23, 1932 in Honaker Kentucky, the daughter of Joe and Josephine (Parsons) Harvey. Mrs. Hall was a Homemaker and had also worked as a Nurses Aid at Fitchville Nursing Home and in Cleveland. She was also previously employed by the Ashland City Schools She enjoyed Knitting and gardening. She was also known by her friends as Onedis. She was preceded in death by her parents, her two brothers, Lenord Harvey and Henry Harvey and sister Bessie Kidd. Services will be held at Heyl Funeral Home on Wednesday November 25,2009 at 1:00 p.m. with Pastor Charles Meade officiating. Burial will follow at Nankin Cemetery. Friends may visit with the family on Tuesday November 24,2009 from 6 to 8 p.m. at the Funeral Home and also one hour prior to the funeral service on Wednesday.